Do you play Candy Crush? If not, you should start playing it immediately. Go on, download the app right now on your mobile phone or tablet. Your HR strategies will benefit from your game play. This year I’ve taken myself out of my HR/recruitment comfort zone and immersed myself in the games industry. I’ve tried to think less like an HR person and more like a gamer and game developer. I’ve attended games conferences, events and exhibitions in New Zealand, the UK and USA. I’ve played games, watched video presentations from games experts, and listened to games publishers and commentators provide reviews and post-mortems on all manner of games. I’ve learnt what’s happening and emerging in the gamification world, and how applying gaming principles to anything can actually lead to amazing outcomes, like fighting disease and saving the planet. Yes, the gaming industry is serious business and should certainly not be trivialised. Games hold 42 percent of the digital content sold across all media. There’s massive money in it, as there are game players who, by all indications, are becoming increasingly addicted to the proliferation of games across multiple platforms, from console through to desktop and mobile. We apparently spend 3 billion hours a week as a planet playing videogames. Over half the internet population plays social games and on average these people spend 9.5 hours per week immersed in game play. Mobile is having major influence on our behaviour, with an annual increase in game activity on our mobile devices of around 45 percent. And we’re creating a significant cohort of young gamers coming through the ranks, with the average young person racking up 10,000 hours of gaming by the age of 21. But many of our assumptions around player demographics appear to be a bit off. Around 60 percent of gamers are over 40 years of age and there’s nearly a 50/50 gender mix. In fact, some leading games are more popular with a female demographic. Closer to home, we exported $31.4 million worth of digital games last year, which is greater than New Zealand’s music or TV exports. I’m in awe of the passion and deep immersion for gaming from within the games industry. At one games conference I attended, I spoke with a well-known games producer who runs a game development studio. They said that they just don’t find as much time to play games in the evening as they used to, with a young family and all, and can now only manage around 4 hours per evening. During the breaks between sessions at the games conferences you can spot attendees playing games on their mobile devices. At the conferences and events they promote hands-on game-play. On the crowded subway in New York on the way to the games conference I noticed lots of fellow passengers playing Candy Crush – all ages, all genders, all races. Then at the conference I heard various presenters and panellists mention that to understand addiction and game mechanics you have to play Candy Crush, one of the world’s current and most popular games. I succumbed and while playing I’ve considered the various game mechanics built in. How does this all relate to HR? From my perspective I/we can learn plenty. My personal motivation is that I want to make job advertising not just more visually engaging but more entertaining, immersive and addictive. I’ve been taking my learning and applying it to Jobgram’s future product design. Below are a few brief takeaways from my short foray into the games sector, and how it can potentially relate to and benefit HR. Even if you’re not a gamer, think about your experiences playing card and board games with family and friends. •	Game design is about psychology. It’s centred around the player and their motivations and emotions. The player is the hero. From an HR perspective, a lot of our employer branding is centred around the organisation and not necessarily the employee or jobseeker. We are often over-branding. The gaming industry invests a lot of time and energy in building different categories of player profiles and how we can design experiences for each player demographic and psychographic. It’s smart stuff. We typically don’t conduct this level of analysis in HR or in our talent mapping initiatives. •	It is good to set up a playing environment where people fail. Yes, fail. It’s when we fail that we learn. And learning and experimentation is rewarding. It motivates us to win. In other words, losing is winning. In the Candy Crush game they explicitly tell you that you’ve failed to reach the next level. Yes, they use the term ‘fail’. Are we in HR creating enough opportunities for people to fail? 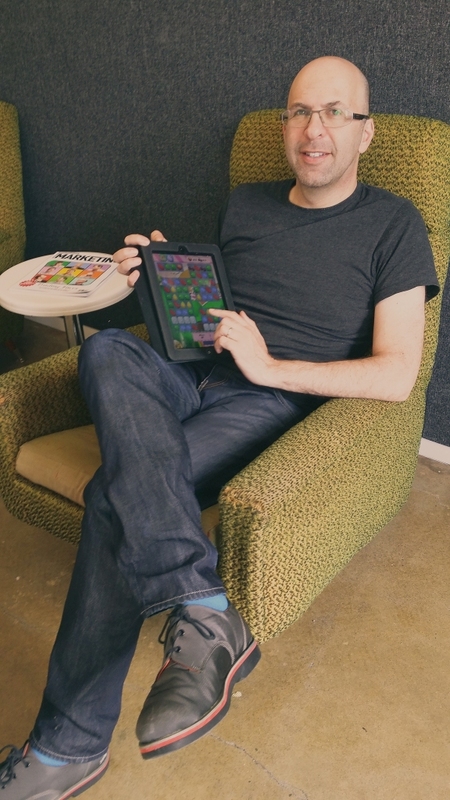 •	Many games, including Candy Crush, build in instant feedback and mini-wins. An instant mini-reward is motivational. There’s a term in gaming called an ‘epic win’ that refers to those occasions when we’ve been trying many times to complete a mission, quest, or level without success and then, voila, we succeed. From an HR perspective are we developing opportunities to close the feedback loop? Is the 6-month or 1-year performance feedback and reward loop too long? And are we creating epic wins every day for our employees? •	One of the awesome things about Candy Crush is that it shows you when you successfully reach a new level, just how far you could’ve gone in your moves in reaching an even higher score. This is a pleasurable experience. Yes the term ‘pleasurable’ is used a lot in gaming conversations, more so than the term fun. Are we doing enough in HR to show and communicate what success actually looks like, or what our employees need to do to go from good to great? Are we creating opportunities for pleasurable experiences on a daily basis? •	Many game players want a snack not a meal. Snackable entertainment offers an opportunity to escape momentarily from reality and to immerse ourselves in another world, albeit briefly. In HR, are we creating bite-sized content, messaging and experiences for our jobseekers and employees or are we drowning them in all levels of complexity and information? •	Game producers talk about retention: next-day retention, next-month retention, next-year retention etc. They want people to come back and keep playing. It’s a big deal. They measure and track the retention data. They aim for player addiction. From an HR perspective, how addicted is the top jobseeker market for our organisations, even if they unsuccessfully applied for a previous role? Are our employees addicted, or just merely engaged? •	Game producers talk a lot about ‘discoverability’. They want their games to be discovered. It keeps them up at night. In HR do we make considerable efforts for our job ads, for example, to be discovered? Are we doing enough to publish content widely and in a targeted way? So is it time to blow up your HR strategies and systems and redesign them with gaming principles in mind? Or hire a game developer to gamify your workplace? Many game developers seriously see an opportunity here. But please don’t turn HR into some sort of whimsical game. It’s far better to gamify work than workify gaming. Great blog Paul. I totally agree with everything you’ve said however I’m conflicted over your Candy Crush call over Minions Rush 🙂 In the business (I talked about in blog #5) had headed down this gaming track. I was involved in the development of a gaming tool which would help NZ SMEs by helping them in developing better business management practices which in turn, would help grow their business. HR & the people element was a big part of that tool. Not a cheap option for businesses (probably big reason that I ended up liquidated) however the value & rewards for businesses, along with HR will be significant. Right I have to get back to Minion Rush now. I didn’t really touch on the social gaming, multiplayer, referral side of things in the post. Excellent blog Paul. CSB (formerly Sonar6) have also done some great posts about using pop culture for HR (like angry birds or Farmville concepts when reviewing performance). What you didn’t include is how to get past level 98 of Candy Crush. I’ve been stuck on it for weeks. Need an epic win! !